Gen Z, who? The eLearning industry is a buzz with strategies for training Millennials and helping them cope with the changing business environment. This leaves Gen Z gaping in the face of the future… wondering how it will fit into the workforce. What about training Gen Z, which is set to account for 20 % of working adults by the year 2020? The eLearning industry is abuzz with strategies for training Millennials and helping them cope with the changing business environment. Coming right after the Millennials, Gen Z are individuals born from 1995 to 2010, comprising of 25.9 % of the United States population alone. 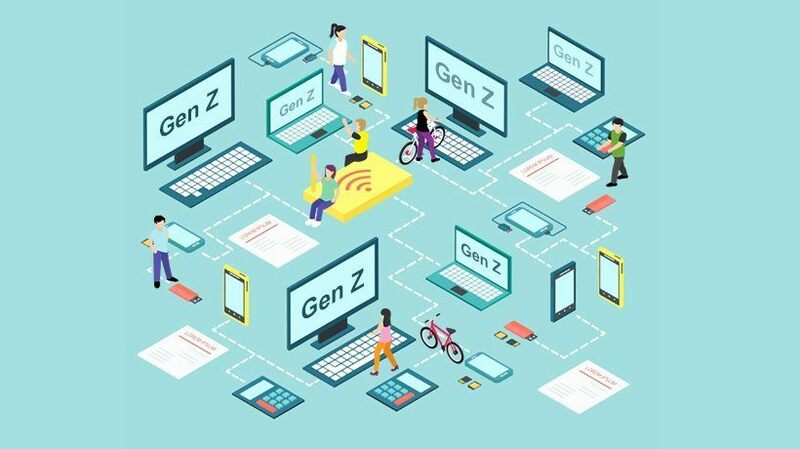 With exposure “at birth” to social media, internet, influential, and entrepreneurial abilities, the generation Z is emerging as the next big Gordian knot for business organizations, big or small! Attracting, training, retraining, and retaining this juggernaut is going to be one of the futuristic challenges that companies will need to tackle head on. Surely, training Gen Z differs from training the Millennials. As more and more Gen Z employees enter the workforce, the master key to their psyche can ensure that employers adapt their workplace to suit the new cohort. This means tweaking the cultural mindset, acclimatizing to technology and bridging intellect – making sure that the mixture has the right proportions of each ingredient. Read this as a balance between generation X, Y, and Z! When assessing a different group (here Gen Z) it is important that we don’t brush off the real differences; instead, deal with the fallacies that are raised and that must be addressed. Here are 5 myths about this generation which raise questions on future training solutions, methods, and ideologies for companies. Gen Z is equally important! Why? There are nearly 70 million members in this population, which are set to come of age in the next 5 years. The sheer size of this multitude of people which bring to the table creativity from a different perspective should not be overlooked. A tangential approach to Gen Z is only going to shoot up the attrition rate. Training for this workforce should be more mentor-oriented, guiding and teaching them as they enter the industry at an early age. Question: How can you adapt eLearning to train young minds? 2. "They Are No Different’"
Gen Z is definitely different! This generation has grown up with technology; for them, it’s hard to go without devices. They are like the "people of internet" (POI), where 41% of Gen Z spends 3 or more hours a day on a screen for non-work related activities. Generation Z is the mobile first and mobile only generation. Training needs to be oriented to their preferences of devices and even time. These young people are looking for flexibility. On-the-go learning, rapid learning, and mobile learning are more relevant to this generation than ever before. Question: How can you best use social media to connect with generation Z? How can you increase online participation in social learning and other activities? 3. "They Are Still Young"
Young in age is not young in mind! Gen Z is turning out to be more mature and futuristic, with 72 % saying that they want to start business someday. This populace is full of early starters, who want to enter straight into the workforce based on efficiency and self-learning capabilities. Industry-academia ties are accelerating exposure and growth of the generation. Question: How can you train college and university students to prepare for an office environment? 4. "They Are Slow And Lazy"
This is a passed down myth! On the contrary according to a recent survey, 90 % of Gen Z prefer a dynamic and fast-working environment. They have grown up in the age of an internet, if anything does not run fast they seem to have a problem with that. They are multitaskers with greater adaptability skills and resourceful as they know where to locate the right information needed. Question: How can you custom content and design to appeal to the fast-flowing vein of this generation? 5. "They Are Not Worried"
Quite the reverse! Though they are self-learners, 64% of Generation Z say they are concerned about being able to get a job. Gen Z people seek mentorship system to help forge strong skills. They have a lot of reason to worry about their future. They are living in an age of competitiveness. Question: How can you improvise knowledge management to mentor a Gen Z worker? "Each generation will reap what the former generation has sown", is a time-honored pattern. It is time to refine and revamp training strategies for creating a next-generation workforce that is more efficient than ever and that is adaptive to their intellectual acumen. Management and recruitment strategies should better engage the new generations rather than expecting them to conform to the old styles.